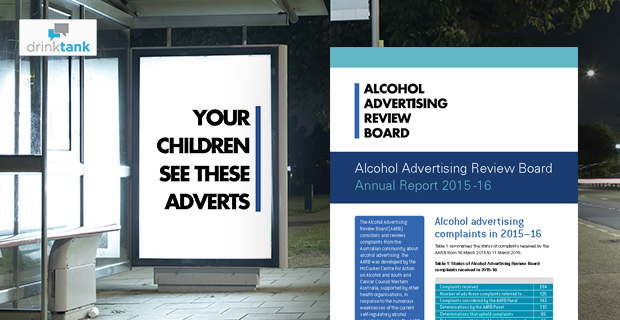 The latest Alcohol Advertising Review Board (AARB) report shows once again that children and young people are being exposed to inappropriate alcohol advertising, and the self-regulatory system continues to do nothing about it. AARB is an initiative of the McCusker Centre for Action on Alcohol and Youth and Cancer Council Western Australia with support from a number of health organisations, developed in response to the weaknesses of the current-self regulatory advertising system. The Board operates independently of the alcohol industry, and reviews complaints from the community about concerning alcohol advertising. The Annual Report released today provides a snapshot of AARB activity in 2015-16, when the team received a total of 194 complaints and produced 110 determination reports. Of the 110 cases reviewed, 96 upheld complaints in full, 12 upheld complaints in part and only two dismissed complaints. The report includes several examples of concerning alcohol ads bought to our attention, which demonstrate the significant flaws in the self-regulatory alcohol advertising system. AARB received complaints about a Bundaberg Rum ad being shown before a Dora the Explorer YouTube video and a Wild Turkey ad on a ‘School Special’ bus in Western Australia. The placement of these kinds of alcohol marketing is clearly inappropriate and shows a blatant disregard for the wellbeing of children and young people. Yet, they do not breach any of the self-regulatory alcohol advertising codes. Australia’s current self-regulatory system has very limited controls on the placement of alcohol ads. The Outdoor Media Association has some responsibility for outdoor alcohol advertising. But the one guideline for alcohol ads – that they cannot be placed on fixed signs within a 150 metre sightline of a school gate – does not apply to buses. There are no regulatory codes that cover the placement of alcohol ads on the internet. The alcohol and advertising industries have repeatedly shown they cannot be in charge of regulating their own advertising. We need a strong, independent regulatory code that will protect children and young people from exposure to alcohol advertising. There is compelling research that alcohol advertising impacts on the behaviours and attitude of young people. A recent systematic review of alcohol marketing and youth consumption studies provides further evidence that young people who have greater exposure to alcohol marketing are more likely to start drinking alcohol at an earlier age, and to drink at risky levels. We also know there is strong community support for stronger regulation. Market research surveys show 72 per cent of Australians support legal controls to reduce young people’s exposure to alcohol advertising, with only six per cent opposed. So the question remains: when will our governments step up and prioritise the health and wellbeing of our children and young people? While there is still a way to go, recent activity shows momentum is growing and provides encouragement to continue our calls for action. Released earlier this year, the AARB report No way to ignore it: The case for removing alcohol ads from public transport called on state and territory governments to take action in their jurisdictions. In August, the South Australian Government announced that alcohol advertising will be removed from buses, trains and trams from mid-2017. Transport and Infrastructure Minister Stephen Mullighan MP said the AARB had “provided compelling evidence that exposure to alcohol advertising impacts on the drinking behaviours and attitudes of young people, influencing their beliefs and views about drinking”. 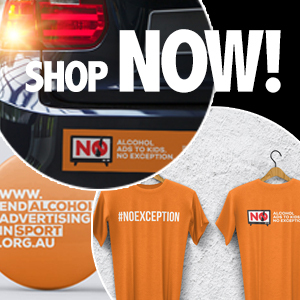 And just last week in Western Australia, the Hon Helen Morton MLC introduced a motion in Parliament encouraging the Government of Western Australia to ban alcohol advertising on state government controlled public transport facilities. Several Members of Parliament expressed support for the measure, illustrating that there is an appetite for reform. These actions show that change is possible. The AARB will continue to advocate for strong, independent, legislated controls on alcohol advertising to protect children and young people, and encourage all levels of government to take action. You can help bring about this change by contacting the Alcohol Advertising Review Board when you see an alcohol ad that concerns you. Making a complaint is quick and simple! To stay up-to-date on AARB activity, follow @AlcoholAdReview on Twitter.